Coffee, right. It's really rather good isn't it? Addictive too. You'd inject it into your veins if you had the chance, right? Dive into a luke-warm vat of it naked and splash round while singing The Coffee Song, right?. Well, maybe that's just us here at T3 Towers. Anyway, here we've got the best Cyber Monday deals on coffee machines for your viewing pleasure. We've got deals on budget machines, we've got deals on mid-range machines and we've also got deals on high-end systems too. Want the best Cyber Monday deals on anything but coffee machines? Then head over to T3's awesome Black Friday deals hub now. Russell Hobbs: get the Russell Hobbs 20770 Purity Coffee Maker Metallic 1.3L 950W for £38.99 at Tesco Direct - a saving of £41. Krups: the Dolce Gusto by Krups Melody 3 Hot Drinks Machine makes perfect coffee, tea and hot chocolate, and is now on sale for £29.99 at Amazon.co.uk - a saving of £40.22. Lakeland: get the Lakeland Red 2-cup Compact Filter Coffee Machine - incredible value at £12.49 (that's half price). Lavazza: grab the chic Lavazza A Modo Mio Minù Coffee Maker for £39 at Lakeland in white or red - reduced from £69.99. De'Longhi: get the De'Longhi Nescafé Dolce Gusto Jovia Manual Coffee Machine for £29.99 from Amazon.co.uk - that's a £60 saving. Krups: enjoy your coffee in style with the streamlined Nescafé Dolce Gusto Oblo Coffee Machine by Krups, down to £37.99 on Amazon.co.uk - a saving of £52. Krups: the Krups Dolce Gusto Melody 3 manual coffee machine is on sale at Amazon.co.uk for £37.99. It's temporarily out of stock, but order now and it'll be delivered when more arrive in Amazon's warehouse. Bosch: fancy your morning coffee with an extra shot of colour? The Bosch Tassimo Vivy II TAS1255GB Hot Drinks Machine is available in blue, pink and lime green for £34.99 at Currys, including a two-year guarantee - a saving of £45. Tassimo: the sleek Tassimo T55 Charmy BRITA Filter Multi Drinks Machine is less than half price at Argos - down to £59.99. De'Longhi: get your coffee loving hands on the De Longhi Icona Micalite Espresso Coffee Machine (in red, for extra style) for £99.97. It's usually £199.97, so that's half off! Order yours today from Appliances Direct. Ninja: not just a coffee machine - a whole coffee bar for your kitchen. Get the smart, sleek Ninja CF060UK Coffee Machine for £99.99 at Argos or price-matched at John Lewis. Ninja: and there's also the CF060UK's bigger brother, the Ninja CF065UK Coffee Machine for £119.99 at Argos too. Lavazza: the Lavazza A Modo Mio Jolie Espresso Coffee Machine makes a wonderful Italian-style espresso, and comes in a range of cheery colours including blue, red and white - all for £49.95 at John Lewis. De'Longhi: the Nespresso Lettissima+ Coffee Machine in stylish candy-apple red is down to £139.99 at Argos. That's half price! Excelvan: get the authentic coffee shop experience with the Excelvan 15 Bar Pump Espresso Italian Style Coffee Machine - Hot Drinks, Cappuccino & Coffee Maker 850W - down to £58.99 at Amazon.co.uk (a saving of £61). Bosch: enjoy over 40 different drinks from brands including Oreo, Cadbury's and Costa with the Bosch Tassimo TAS5542GB Hot Drinks and Coffee Machine - now £59.99 at Amazon.co.uk - a saving of £80! De'Longhi: grab the superb De'Longhi ESAM2800 Fully Automatic 1450W Bean to Cup Machine in Silver & Black and enjoy delicious coffee at the push of a button. It's £174.99 on Ebay.co.uk - that's a £66 saving on the usual price! Bosch: get cafe-quality tea, coffee, hot chocolate and other drinks whenever you like with the Bosch TAS4502GB Tassimo Joy 2 Hot Drinks and Coffee Machine - reduced to £59.99 at Argos. That's a saving of £80! Lavazza: make yours a latte with £50 off the Lavazza A Modo Mio Fantasia LM7000 Cappuccino Latte Coffee Machine - now reduced to £109.95 at John Lewis. The saving applies to the cream and black models. Morphy Richards: fancy an espresso? The Morphy Richards 172004 Accents Espresso Coffee Maker is £64.99 at Amazon.co.uk. That's less than half price! De'Longhi: the De'Longhi EC271 Espresso Pump Coffee Machine is down to £44.99 at Currys - a saving of £80! De'Longhi: the Nespresso by De'Longhi EN521.R Lattissima+ Coffee Machine makes beautiful creamy cappuccinos, and is less than half price for £119 at AO.com. De'Longhi: make delicious coffee from beans or grounds using the De'Longhi Magnifica ECAM22.113.B Bean to Cup Coffee Machine - now half price for £249 at AO.com. De'Longhi: the super-stylish De'Longhi Magnifica ESAM4000.B Bean to Cup Coffee Machine makes two shots at once, with a heater to keep water at the perfect temperature and a built-in milk frother for perfect lattes and cappuccinos. Get it for £199 at AO.com - a saving of £160! Jura: pick up the Jura F85 Bean-to-Cup Coffee Machine for £699.99 from John Lewis and save £300. Melitta: get the Melitta Caffeo Compact Coffee Machine - was £389.99, now £319.99 at Argos. 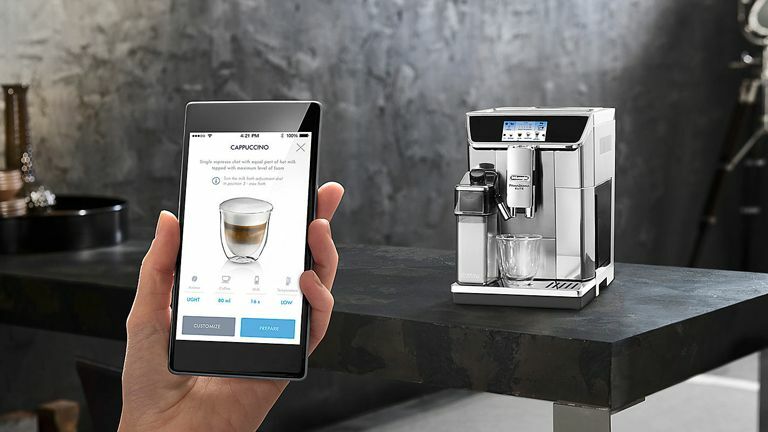 De'Longhi: the De’Longhi ESAM650.75 PrimaDonna Elite Bean-to-Cup Coffee Machine is a state-of-the-art coffee machine that connects to your smartphone so you can select and create your perfect drink with a couple of taps. It's £1,350 at John Lewis, and comes with six thermal glasses, a coffee taster pack, six months of descaler and free machine servicing. Krups: the Krups Espresseria Automatic EA81 Series Bean to Cup Coffee Machine cleans and de-scales itself once it's finished preparing your delicious coffee to your exact specifications. Get it for £250 at IWOOT - a saving of £249. De'Longhi: if you're serious about your coffee, the De'Longhi Magnifica S ECAM 22.360.S Bean to Cup coffee machine is the one for you. This multi-function coffee maker with built-in grinder and milk-frother is £349 at Currys - a saving of £380.99. The same model without the milk jug is £299 at Currys. Sage by Heston: with automatic grinding, dosing and tamping; optimum water temperature; a dedicated steam boiler; pre-infusion to expand the coffee grounds and an adjustable milk steamer, Sage by Heston Blumenthal BES980BSUK The Oracle turns coffee-making into an art form. It's down to £1,223 at IWOOT in black or steel. Sage by Heston: if your budget won't quite run to the Oracle (above), the The Sage by Heston Blumenthal Barista Express Bean-to-Cup Coffee Machine also delivers beautiful coffee every time for £439 at IWOOT. Lavazza milk frother: For the perfect cappuccino, get the Lavazza milk frother in black for £28.50 at Lakeland - that's less than half price. Tassimo Latte capsules: Buying a new coffee machine that takes pods? Grab a bag of 80 Tassimo Costa Latte pods (80 pods, 40 servings) for £15 from Amazon.co.uk. Smooth and creamy - just like you'd get at Costa on the high street. Lavazza Espresso capsules: Get a pack of 16 Lavazza A Modo Mio Qualita Rossa Espresso capsules for just £3 at John Lewis. They make a coffee that's rich, spicy and delicious! Lavazza Espresso capsules: Variety is the spice of life, so why not grab a pack of Lavazza A Modo Mio Cereja Passita Brazil Espresso Capsules too? They're Rainforest Alliance certified, and have notes of sweet honey and chocolate. A pack of 12 is a snip for £3 at John Lewis. Lavazza Espresso capsules: If you prefer your coffee light and floral, try the Lavazza A Modo Mio Selva Alta Peru Espresso Capsules. Grown on the slopes of the Andes and yours for £3 for 12 at John Lewis.